In this tutorial you will learn how to create a 2D radial array (slightly more complex Then the common 1D array), the purpose of this tutorial is to familiarize yourself with max's powerful array tool. 1. 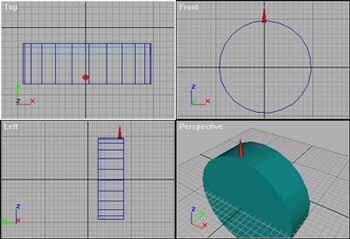 Create a scene that looks similar too figure 1.0 ( A cylinder with a single cone on top of it). For this scene I used a cylinder with a Radius of 95 And a height of 6, for the cone I used Radius1 if 4.0 And radius 2 of 0 And a height of 32. 2. Once you have this simple scene completed, Click on the cone Then click the "hierarchy" button. Then click the "affect pivot only" button. And move the cone's pivot to the center of the cylinder, as shown in figure 1.1, once the pivot point is in the center, uncheck the "affect pivot only" button (its important you do not forget this, otherwise only the pivot will get arrayed). 3. Now select the front viewport,( this is also important since the array determines the axis's according to the selected viewport). From the front viewport click the "array" button. 4. 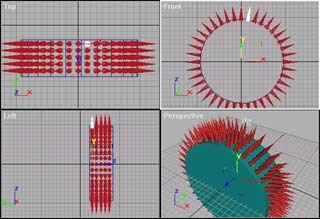 Still in the array transformation screen, click the small arrow near Rotate to change the rotate value to totals instead of incremental, And Then change the Z axis value to how many degrees you wish for the cones to be arrayed, For this sample I used 360, so that the cones would be arrayed throughout the entire cylinder. 5. Under 1D count, change the the amount too 40, or your desired amount (slow computers might want too use a slightly lower number). This count value is the amount of cones that will be arrayed around the cylinder in only 1 degree, the degree from witch the viewport is selected. 6. Since we are doing a 2D radial array, check off the 2D radial button, change the count too 5, for this scene, this will be the number of rows of 1D array we will have, Then change the Y value too 11, (this is the distance between the cylinders going in the Y direction. Now your settings should look just like in Figure 1.2. Now just play around with some settings, see what you can do with the power of array :).